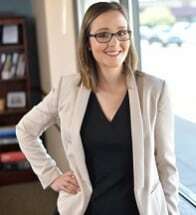 Katelyn Bounds is an associate attorney working in the Workers' Compensation Division of Midwest Disability, PA. She earned her J.D. from Mitchell Hamline School of Law in Saint Paul, Minnesota where she was a member of the Business Law Society, Women Law Student Association, and Phi Alpha Delta Law Fraternity. She received certificates in Law and Business and Public Interest. She also served as judicial extern for the Honorable Donovan Frank in the U.S. District Court for the District of Minnesota. Katelyn is originally from Anchorage, Alaska before moving to Saint Joseph, Minnesota to attend the College of Saint Benedict and Saint John's University. She graduated with a Bachelor of Arts degree in Psychology, Political Science, and Spanish. Katelyn was a member of the St. Benedict women's hockey team and studied abroad in Valladolid, Spain. In her free time, Katelyn coaches the Anoka/Rogers 12UA girls' hockey team, plays adult league hockey, and enjoys baking.